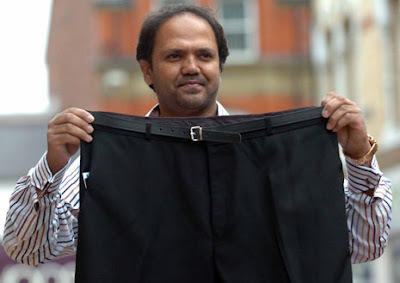 That picture up above is of British school uniform supplier Nadeem Ahmed holding the size 44inch waist trousers he's been selling to kids as young as 13. In fact a recent report describes how some of Britain's largest retailers of childrens' clothing are joining together to fund a study into just how big Britain's children have gotten. They're going to use high-tech scanners to measure shapes and sizes with the aim to roll out better fitting clothing for ever-larger children. Yet you'll still find folks vehemently denying increasing rates of childhood obesity. I guess the clothing industry is in on this giant public health conspiracy.